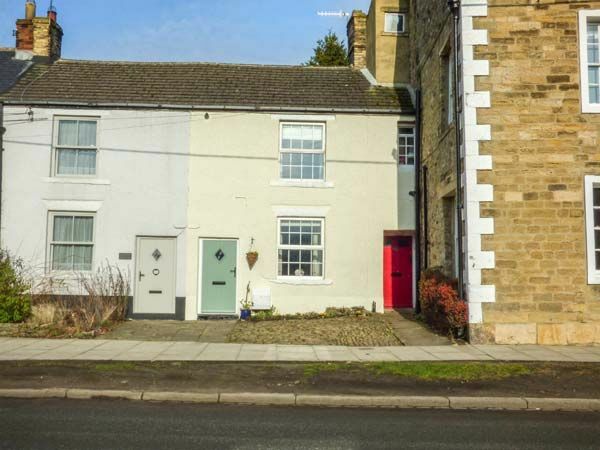 Mill Cottage is a delightful mid-terrace cottage in the small market town of Wolsingham. The cottage sleeps three adults and one child in two bedrooms which are a double and a twin room. There is also a bathroom, a ground floor shower room, a kitchen and a sitting room with a dining area and a woodburner. Outside there is parking and storage space in a garage with additional roadside parking available and there is an enclosed patio with furniture. Mill Cottage is in a fantastic location with walks from the door. Amenities: Gas central heating with woodburner. Electric oven and hob, microwave, fridge/freezer, washer/dryer, dishwasher, Smart TV with Freeview, DVD, WiFi, selection of books, games and DVDs. Fuel, power and starter pack for woodburner inc. in rent. Bed linen and towels inc. in rent. Garage opposite cottage for 1 car and bike storage. Roadside parking for 1 car. Private enclosed rear patio with furniture. Sorry, no pets and no smoking. Shop and pub 2 mins walk. Note: There is limited headroom in twin bedroom and one bed is only be suitable for a child. Note: Cottage is on a set back from a busy road and there may be some associated noise. Note: Max 3 adults. Region: Northumberland is a heady combination of fishing villages, market towns, sandy beaches, magnificent castles and historic Hadrians Wall, tied together by beautiful countryside and abundant wildlife. Town: The picturesque town of Wolsingham is a quintessentially British market town in the North Pennines Area of Outstanding Natural Beauty. Nestled in the beautiful valley of Weardale, the town is a popular stop-off point for visitors. The town boasts a number of well-regarded pubs, cafes and restaurants, as well as convenience shops and takeaways. In the town youll also find an indoor swimming pool and gym, grass bowls club, several picnic areas and a recreation ground with outdoor gym and playing fields. Two bedrooms: 1 x double, 1 x twin (one bed suitable for a child only). Bathroom with bath, basin and WC. Ground floor shower room with shower, basin and WC. Kitchen. Sitting room with dining area and woodburner. Gas central heating with woodburner. Electric oven and hob, microwave, fridge/freezer, washer/dryer, dishwasher, Smart TV with Freeview, DVD, WiFi, selection of books, games and DVDs. Fuel, power and starter pack for woodburner inc. in rent. Bed linen and towels inc. in rent. Garage opposite cottage for 1 car and bike storage. Roadside parking for 1 car. Private enclosed rear patio with furniture. Sorry, no pets and no smoking. Shop and pub 2 mins walk. Note: There is limited headroom in twin bedroom and one bed is only be suitable for a child. Note: Cottage is on a set back from a busy road and there may be some associated noise. Note: Max 3 adults. property has everything that is required and is absolutely superb. I can definitely recommend this a great place to stay and will be back myself . The house is newly renovated and has all modern comforts, upstairs and downstairs bathrooms, pleasant bedrooms and living room, well-equipped spacious kitchen. Everything was very clean and we did not experience any problems with appliances or WiFi. What we enjoyed most about the house was the little garden in the back of the house on sunny days. The owners, who live across the road, were very kind and helpful.